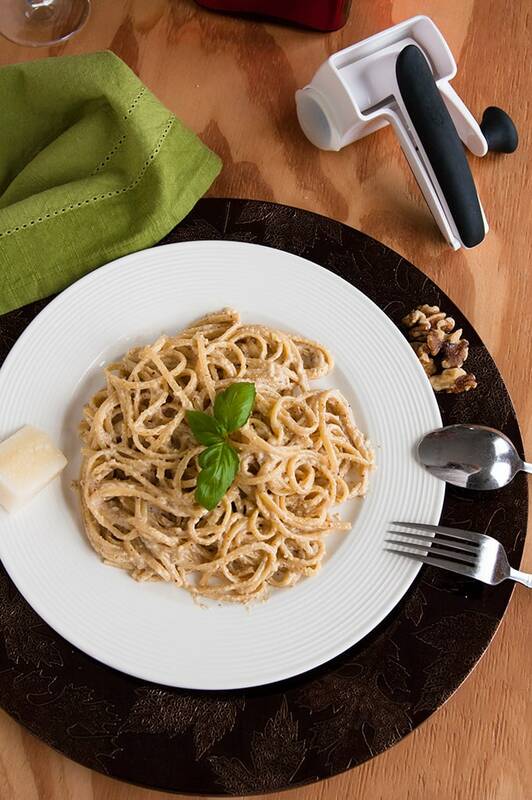 We love this easy Linguine with Creamy Walnut Sauce, based on a dish we ate near Genoa. Just throw the mascarpone and other sauce ingredients in the food processor or blender and give them a whirl! 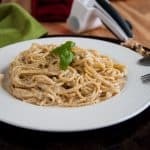 Once upon a time, my family and I ate the most heavenly linguine with creamy walnut sauce while on the Italian Riviera, in the region of Liguria. It was the same trip where we first tried pesto. 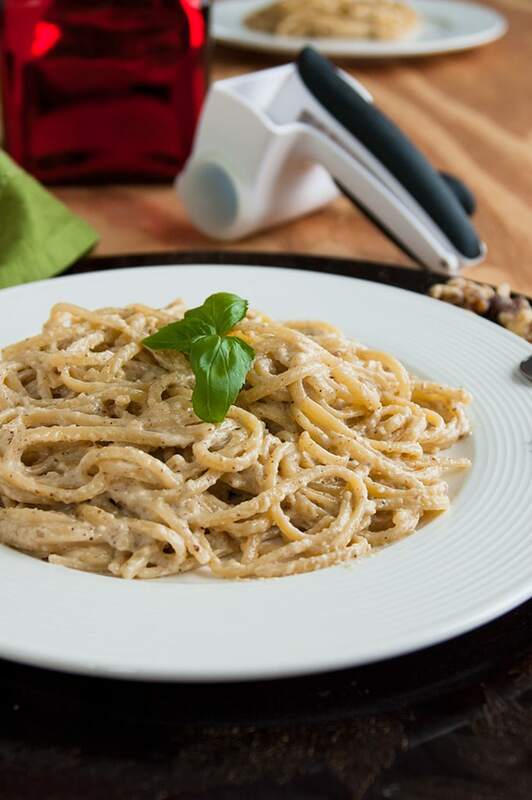 I featured Mom’s Pesto with Pecorino Romano here on the blog, but the creamy noce sauce remained on my bucket list. I don’t know many meals that can evoke joy by mere mention nearly 35 years later. When I announced at Sunday dinner over my parents’ that I was working on a walnut sauce recipe similar to the one we had in Italy, suddenly, everyone stopped eating and looked up. “I loved that walnut sauce!” Mom exclaimed. “I loved that walnut sauce!” Dad echoed. And so it was with great anticipation and excitement that I tested and tweaked this recipe. I happened to come across a version of it in the Italian cookbook Nonna’s House. I saw a sauce using mascarpone and walnuts and instantly felt inspired. “Mascarpone!” I thought to myself in that “aha” moment. Brilliant! In case you’re not familiar, mascarpone is Italian cream cheese, and is made of, well…cream. It’s the luscious ingredient in tiramisu. Why not use it in a creamy walnut sauce? So, I got in the kitchen and began experimenting. I had to add garlic, of course, and taking a note from Mom’s pesto, decided to go with a 50-50 combination of Pecorino Romano and Parmesan cheeses. I increased the walnuts and olive oil, substituted a little fresh basil for the parsley, added salt and pepper, and incorporated a bit of butter and some pasta water into the final dish, to achieve a nice consistency – no dryness allowed. And, guess what? Once the walnuts are toasted in a pan on the stove, all the sauce ingredients get blended in the food processor or blender in a matter of a couple minutes. The result is essentially a blonde walnut pesto. Oh, my goodness. Delizioso! I don’t know how close my recipe is to the pasta with creamy walnut sauce we ate near Genoa so many years ago. But, our tastebuds are happy. I hope you give this dish a try! An easy and delicious vegetarian pasta dish from Italy! Toast your shelled walnuts in a 10-inch pan on the stove for about five minutes over medium-high heat, stirring occasionally. The walnuts are ready when they are fragrant. Don't let them burn. Set the pan aside on a cool spot on the stove. Place a pasta pot filled 2/3 high with hot water on the stove over high heat. Add about a couple teaspoons of salt to the water and cover the pot. While the water is heating, prepare your walnut sauce. 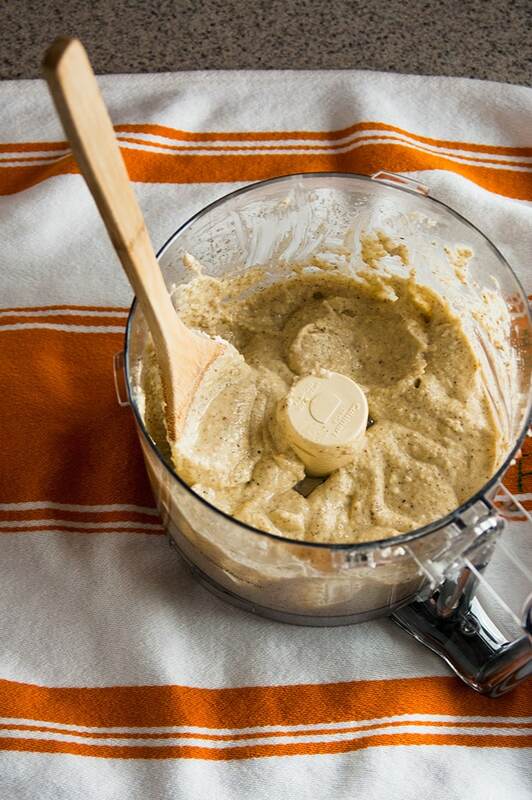 Place the toasted walnuts and all the remaining sauce ingredients in your food processor or blender. Process until the sauce becomes a smooth paste, scraping down the sides as needed. When the water is boiling, add your linguine and stir it in. Lower the heat a bit and continue cooking the pasta until it's al dente. While the pasta is cooking, scoop out a cup of the pasta water (I use my ladle and take two scoops) and place it in a pasta bowl near the stove. Drain the pasta when it's cooked, setting it in a colander in the sink. Add your butter to the pasta pot, then return the linguine to the pot. Stir it a bit, so it doesn't stick. Add all of the walnut sauce to the pot, along with one ladle of the reserved pasta water. Stir to combine with the pasta and add extra reserved water as needed, so that the pasta is not dry. Serve immediately with red pepper flakes and extra Parmesan. If you have any leftovers, stir in any remaining, reserved pasta water to the leftovers and store, covered, in the refrigerator. The leftover pasta will be dry, so you will need to add some butter or olive oil when reheating it. It's best to enjoy this dish immediately, since the leftovers will become dry. If you know you'll only need half a pound of pasta, use half of the sauce and store the leftover sauce in a covered container in the refrigerator. Then, you can cook fresh pasta to go with it the next time, adding butter and some reserved pasta water. 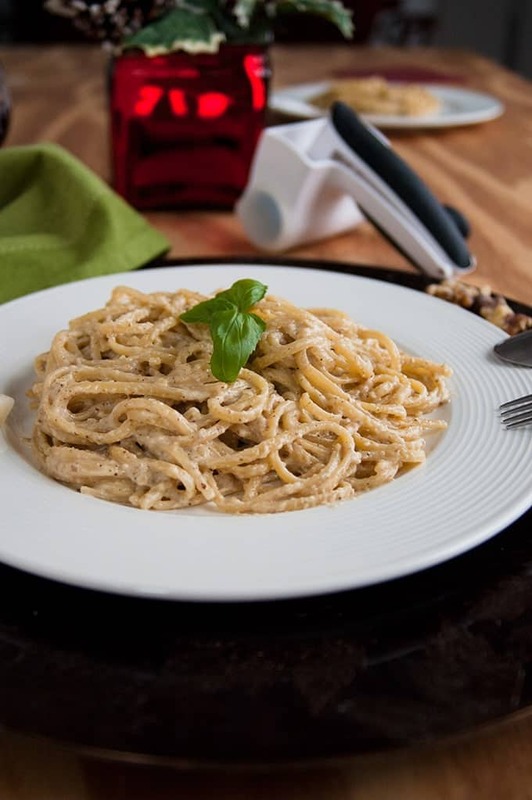 “Once upon a time, my family and I ate the most heavenly linguine with creamy walnut sauce while on the Italian Riviera …” You had me at go! I loved your family’s response to your making this sauce. Food is just like that. It takes you back and then brings that same joy right into the present. I’ve never heard of walnut sauce, so I’m so glad you shared this! What an awesome twist adding walnuts into the creamy mixture! love them in pesto, so this sounds great! This really is like a blonde walnut pesto. We love the flavors here. Thanks, Anjali! Creamy walnut sauce sounds amazing! I want to make it for my weeknight dinner! It’s perfect for a quick weeknight dinner, and decadent enough for company. I hope you enjoy this, Ilona! Walnut AND mascarpone?! Now this I have to try. Pinning! Oh, yes, Matt. It’s a beautiful thing! What a beautiful dish! My husband and I visited Genoa as well. I can’t wait to make this for us so we can relive our grand Italian adventure! Isn’t it wonderful how food brings back great memories? Enjoy, Luci! I hope you give it a try, Angie!